The traditional Remembrance Day ceremonies went ahead on Sunday as they do year after year, in memory of the thousands of men and women who have sacrificed their lives in military service. On Remembrance Day weekend I caught a CBC radio interview discussing whether or not there is a conflict between the red poppy campaign and the white poppy campaign. The red seems to put a focus on honouring sacrifice, viewing war as a necessity while the white puts a focus on mourning the losses, a rejection of war, and a call for peaceful conflict resolution. There is value in commemorating the losses, whatever focus you put on it. Those who were marched into battle and gave their lives for the rest of us ought to be remembered. Equally, or more so, the bandage needs to be ripped off from time to time to mourn the horrendous social cost of war, to motivate us in avoiding future armed conflicts. Another day of remembrance is just around the corner. I doubt many of you have ever heard of it, even though it commemorates a loss of life to Canadians over the last 50 years that exceeds the loss of Canadian lives in both world wars. The loss of life is just the tip of the iceberg. It also commemorates the hundreds of people injured for every fatality, many permanently. 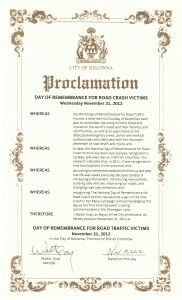 I am referring to the National Day of Remembrance for Road Crash Victims. In 2005, the United Nations endorsed a World Day of Remembrance for Road Traffic Victims to be observed every third Sunday in November each year, making it a major advocacy day for road traffic injury prevention. Governments around the world were encouraged to commemorate this day. With a daily loss of life on roads throughout the world of almost 4,000, and hundreds of thousands injured every day, it is an issue that caught the attention of the UN. Canada’s National Day of Remembrance for Road Crash Victims is the Wednesday following the World Day, and was first commemorated in 2008. That day falls next week on Wednesday, November 21, 2012. Commemoration of the day in British Columbia has been extremely limited, virtually non-existent. To my knowledge, the day has never been commemorated in Kelowna. 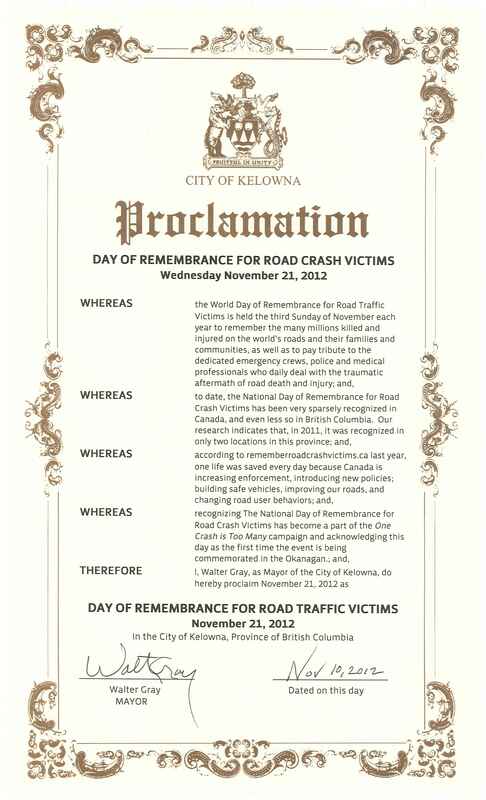 At my request, Mayor Walter Gray has proclaimed November 21st, 2012 as a Day of Remembrance for Road Traffic Victims in the City of Kelowna. I prefer the wording “Road Traffic Victims” to “Road Crash Victims” because it is all inclusive. I am thinking specifically of pedestrian casualties. There is a “red poppy” element to the day, in honour of the emergency services personnel who are killed and injured responding to road traffic incidents, and otherwise doing their jobs on our roadways. There is also a white poppy element: recognizing and mourning the losses so as to motivate us to do something about it. The loss of life and injuries just keep marching on day after day, week after week, year after year, as if like troops continually marching into battle. 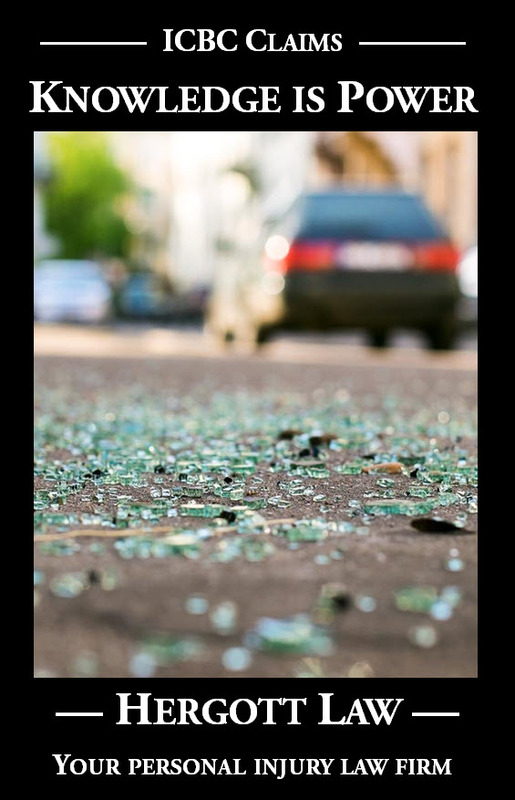 The maddening reality is that road traffic casualties are preventable. A Day of Peace has been suggested as a global initiative: a day of respect by and towards all road users; a day on which exceptional care is taken by motorists; a day of courtesy at the wheel and a day when all road laws are respected so that a world day without any crashes resulting in injury or death will become a reality. Can we start that as a British Columbia initiative in Kelowna on November 21st? Statistically, there is an injury approximately every 3 ½ hours in Kelowna alone. Can we go 24 hours without any injuries or deaths? Can a seed we plant here grow to include other communities, and to include all of British Columbia? Can a day without injuries or deaths grow to a week? Can we start something that makes a real difference? Join me, local emergency services personnel, those mourning road traffic injuries and deaths, and others motivated to make a change on Wednesday evening, November 21st, at 5:00 p.m. in the Orchard park Shopping Mall parking lot, corner of Dilworth Drive and Highway 97, for a brief commemoration of this important day. One crash is too many. If we start believing that and driving like we believe it, we can make a difference.